Wilfred Theodore (Ted) Weems was an American bandleader and musician. Weems' work in music was recognized with a star on the Hollywood Walk of Fame. The Fontane Sisters were a trio from New Milford, New Jersey. Ray Charles was an American musician, singer, songwriter, vocal arranger and conductor who was best known as organizer and leader of the Ray Charles Singers who were featured on Perry Como's records and television shows for 35 years and were also known for a series of 30 choral record albums produced in the 1950s and 1960s for the Essex, MGM, Decca and Command labels. We Get Letters is a 1957 album by Perry Como, his second RCA Victor 12" long-play album. The LP's concept is an album of requests from Como's television show, but forgoing the usual big-band sound of Mitchell Ayres' Orchestra and the Ray Charles Singers for a small group known as "Como's little Combo", with soft, breezy jazz arrangements. The album was recorded between June 1956 and February 1957. Saturday Night with Mr. C was Perry Como's third RCA Victor 12" long-play album, and his first recorded in stereophonic sound. The album is structured as an extended version of the request section of his popular television show, beginning and ending with his theme songs "Dream Along With Me" and "You Are Never Far Away" and with his TV request theme, "We Get Letters" used twice in the album as an intro. At the time, Perry was seen on NBC's Saturday night schedule at 8 P.M. Eastern Time. Perry Como in Italy is Perry Como's 14th RCA Victor 12" long-play album. Frank Gallop was an American radio and television personality. 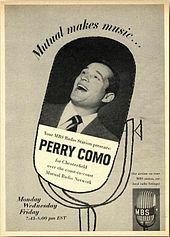 Perry Como was a prolific recording artist for the RCA Victor label between 1943 and 1987, and is credited with numerous gold records. Como had so many recordings achieve gold-record status that he refused to have many of them certified. Over the decades, Como is reported to have sold millions of records, but he commonly suppressed these figures. 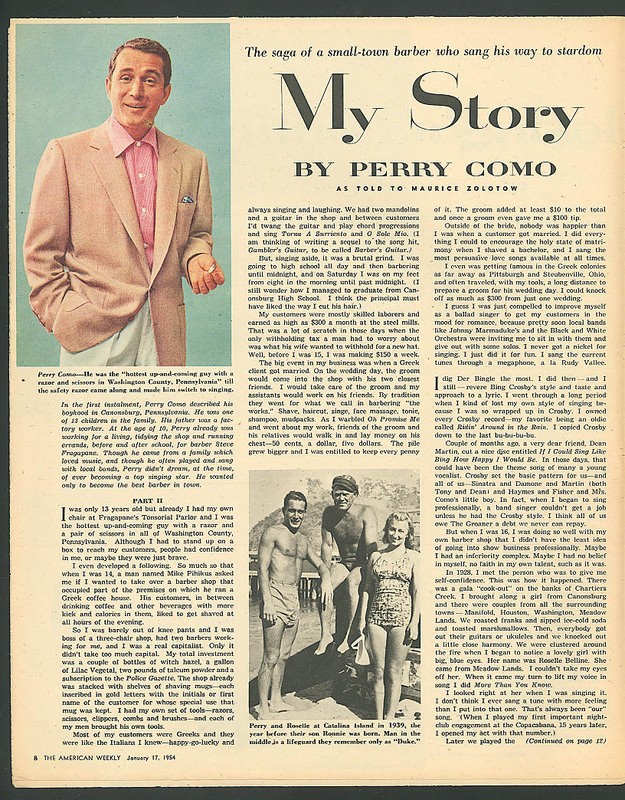 This is the final release of Perry Como's long career. Taped live at the Point Theatre in Dublin, Ireland, before an audience of 4,500, including Irish President Mary Robinson, it was also issued on videotape and aired on PBS. The videotape of the concert shows a man who appears frail and unwell. Como reportedly was suffering from the flu and struggled to perform, losing his voice at one point during the concert. The finished version of the concert is less than 90 minutes long; the recording took more than four hours to complete. Despite it all, Como managed to complete his last recorded performance with dignity and professionalism, earning him the applause of his audience. Nicholas Perito was an American Hollywood composer and arranger and, for 40 years, the closest collaborator of singer Perry Como. 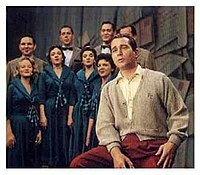 At the Supper Club is a posthumous 2010 album consisting of recordings of Perry Como performing on the radio variety show The Chesterfield Supper Club, recorded for the Armed Forces Radio Service (AFRS), in 1946. Others featured on the broadcasts are Lloyd Shaffer and his Orchestra, The Satisfiers, and announcer Martin Block. Guests include Nat King Cole, Spike Jones and his City Slickers, Peggy Lee, Diana Lynn and the Modernaires with Paula Kelly. Mitchell "Mitch" Ayres was an orchestra leader, music arranger, composer and performer. He is best known for his many years of work with Perry Como on radio, records, and television and as the musical conductor for The Hollywood Palace. After Perry Como left the Ted Weems Orchestra in late 1942, he returned to his home in Canonsburg, Pennsylvania with the idea of going back to his barbering profession. Como had many offers before and after he was back in his home town. As he was preparing to sign a lease to re-open a barber shop, he received a telephone call from Tommy Rockwell, who was with General Artists Corporation. Rockwell, who also represented Ted Weems, offered Como a sustaining (non-sponsored) radio program on CBS and also to get him a recording contract. The offers made by Rockwell meant remaining in New York to perform with no more road tours as had been the case for many years when Como was with both Freddie Carlone and Ted Weems. 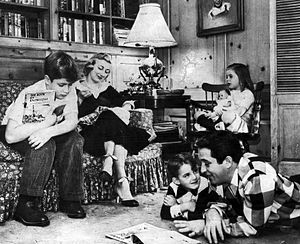 On the advice of his wife, Roselle, Como agreed to go to New York as it meant he could continue working in the music business and not be separated from his family.